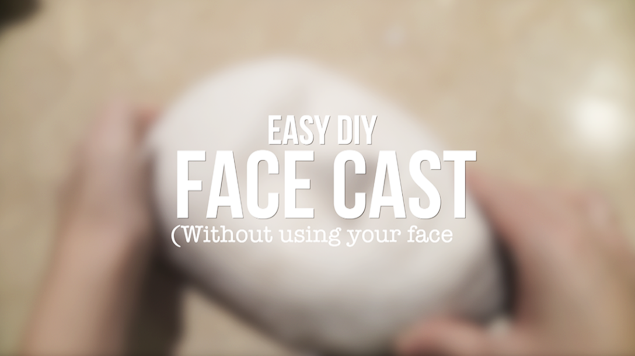 A few years ago I filmed a tutorial with Stuart Bray on how to take a face cast. Like a lot of special effects, it’s not the easiest thing to make and the tools and equipment needed aren’t always massively affordable. I’ve had a lot of questions asking about a cheaper, easier option, so today I’ll be doing just that. Do bear in mind though that this won’t be perfectly fitted to your face, so it won’t work for all my tutorials – some of which need to fix the face perfectly – but it will do for a lot of them. So if you wanted to have a face cast to make props on, or you’re a little claustrophobic and don’t want to have alginate encapsulating your face, then this video might be for you.